Situated on the Southern end of Sturgeon Lake just North of Lindsay, this CA boasts twelve trails, plus a section of the Victoria Rail Trail too. Don’t be intimidated though, all totalled, the twelve trails are less than eleven kms. Getting there is simple enough. Take Hwy 35 (35/115 from the 401) and take a left at Hwy 7, then a right at Angelina St. and drive ‘til Angelina St. ends at Kenrei Rd. No that’s not a typo, Ken Reid CA is on Kenrei Rd. 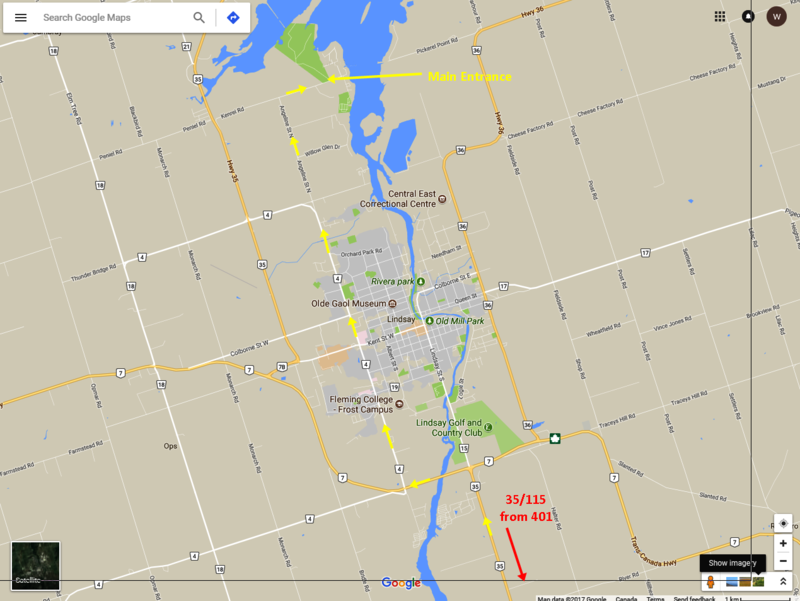 Make a right and in about one km, you’ll see the entrance on your left (277 Kenrei Rd., Lindsay, Ontario if you wanna get directions from Google maps) It’s “pay and display” by a drive through type of thing on the right side of the road in, and it’s only $2.00 for the whole day. I like this CA because it has two roads into the trails (Conservation & Marsh Lanes). Due to its shape and location, getting to the trails Northeast of the Victoria Rail Trail, would involve a lot of walking without those roads. Since there are so many trails in there I think what I’ll do is cover them by proximity to the individual parking lots. So, I’ll start with the Main parking at the Administrative and Field centers. Technically, there are three trails from here. The Escarpment Loop walks through some (in September anyway) fields of goldenrod, and about ¼ up the side of a ridge (escarpment) through barren cedar forest. For about ½ it’s length, it’s within earshot and visual range of one roadway or another. The Memorial Trail (loop) is about 200 steps in a rough circle around the goldenrod meadow, just off the Escarpment trail. What it’s in memorial of, I have no idea. The Pond Loop meanders through the forest and meadows until it pops out onto the road you drove in on. The Pond is bisected by the road you drove in on too. It has a small dock you can step out on. Now let’s carry on up Marsh Lane to the first parking lot. This one will start you off on the Woodland Loop by crossing a floating boardwalk. From there you’ll get a very picturesque view of McLaren Marsh and then you’ll plunge into a deep, canopied woodsy trail. I unofficially renamed the rest of this trail “The Rocks, Roots, & Muck Loop”, ‘cause if you wanna look around, you’d better STOP to do it. Otherwise, you’ll find yourself doing a face plant with your toe under a rock or root sticking up outa the ground. Seriously, watch your feet on this trail. There are areas where all you have to walk on are rocks and roots. The mud patches were passable in September, but this trail will be very mucky in the Spring or after a day of rain. The Marsh Lookout Trail is just a shortcut to the lookout without having to walk the whole Woodland Loop. The Trillium Pass and Rabbit Hollow just wander through the same forest as the Woodland Loop. After walking all that deep canopied forest, you might be ready for some open air and sunshine. The Dragonfly Trail will provide you that. So you could leave your car in the same lot and just walk to the next parking lot (on Marsh Rd next to the Victoria Rail Trail) via the Dragonfly Trail. Its only 305 meters long and is appropriately populated with scads of dragonflies, through open sky sunshine and meadow flowers. The Point Loop is immediately on your left, as you walk through the second gate across the Victoria Rail Trail. This trail doesn’t quite give a view of the open water (just visible through the trees) until you’re at the point’s tip. Even then, the view is a bit stingy. The Shoreline Trail will provide you with a couple more opportunities. The Camp Trail isn’t worth bothering with unless you’re bashful, and in need of serious and immediate relief (permanent washrooms available here). You’ll come across a rather rickety old boardwalk that cuts across to The Cedar Forest Loop, very near the end of the Point Loop. Unless you opted to take the boardwalk over to walk the Cedar Forest Loop, you can finish the Point Loop, and drive back down to Conservation Lane and up to it’s terminus, to walk the Cedar Forest Loop. It’s aptly named with the exception of a stretch through a meadow (which was actually a separate trail a few years ago, called, “The Meadow Trail”). Though not part of the official Ken Reid CA trails, there is the Victoria Rail Trail which runs through the CA. It’s greatest contribution to the Ken Reid CA is … the Causeway over the McLaren Creek Wetland. Great photo op here, not to mention a lovely spot for a trail snack. You’ll have to return once you’ve been on the causeway as that trail isn’t a loop. Ken Reid CA is North of the Oak Ridges Moraine so she’s pretty flat and easy walking. However, containing the McLaren Creek wetland, and being on the shore of Sturgeon Lake, it can be mucky and unbelievably buggy in the Spring. Best visited in the Fall of the year. There are 12 named trails, but only three are measured in kilometers (The longest being only 2.6 kms). For the most part, all the trails are wide enough for two to walk shoulder to shoulder and vary in base from paved roadways through meadows to mucky lowland paths. There are two short boardwalks. Trail benches are rare, occurring mostly at lookout points for the wetland and Lake. All trails and parking areas were clean, and clear of trash. 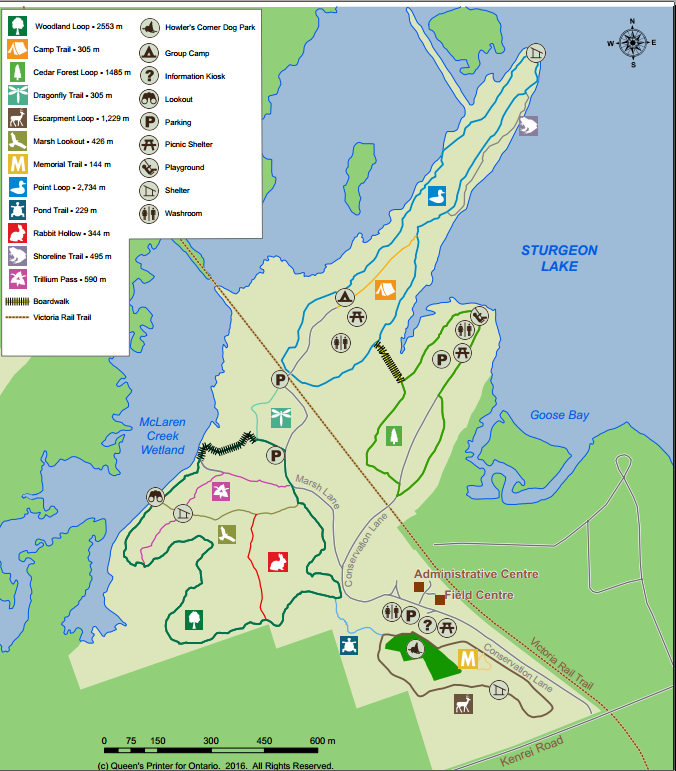 Permanent washroom facilities are present at three large picnic sites, and with exception of the Pond Trail and Escarpment Loop, these trails are quiet (the omnipresent Southern Ontario cessna notwithstanding). The charge for use is $2.00/day/car no matter how many parking areas you use. Thanks again for a really good overview of a trail worth seeing. I was at this one in the summer on the bike route. I will go back now with my dog and walk the walk. Appreciate your journeys. And we appreciate you taking the time to comment Kevin. It’s good to hear from you again. Bundle up. The walking’s gonna start getting chilly.